How to Recover Deleted Call Logs from LG G5? Home > Resources > LG > How to Recover Deleted Call Logs from LG G5? Your LG G5 has fed up with massive data that you are going to delete some of them in order to speed up the phone. You just thought the call logs were useless so you just directly deleted them off without consideration. But later, you found that the deleted call logs contained important phone numbers that you hadn't added to the contacts. Therefore, how to recover deleted call logs from the LG G5 Android phone? 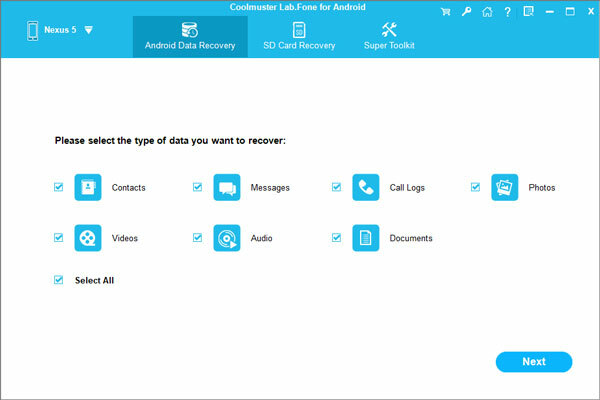 In this case, we strongly recommend Coolmuster Lab.Fone for Android - an easy to use Android data recovery program to help you recover deleted and lost call logs from LG G5/G4/G3/G2. It is trusted by many users owning to its intuitive interface and powerful function. It allows users to recover not only call history, but also contacts, text messages, photos, videos, audio files, documents and more from overall Android devices. This LG Call Logs Recovery tool helps users recover deleted call logs on LG G5 including name, phone number, date, type with simple steps. All the exported call history is saved as HTML. The following guide tells you how. 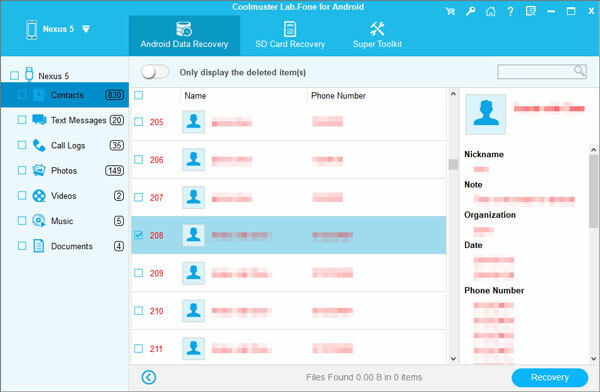 Launch the Lab.Fone for Android on your computer after you downloaded and installed it. Next, plug your LG G5 to the computer using a USB cable. The software automatically recognizes your LG G5. All the file types are displayed on the window. Please choose the category of "Call Logs" and click "Next" button. Then, the program starts to scan your LG G5 to find all lost and exiting call logs. The lost ones are displayed in red color. You can preview and select the call logs you want to recover by ticking them off. After the selection, you can directly give a click on the "Recover" button to begin the recovery process. All the selected call logs will be exported in HTML format.